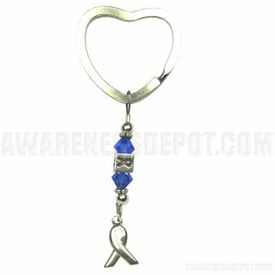 Prostate Cancer Swarovski Crystal and Sterling Silver Keychain. Made with Swarovski crystals and .925 sterling silver. The charms, Bali 6mm beads, spacers and even the wire is .925 sterling silver. These are gorgeous and make a great gift!! Made by a mother who has an autistic child. Charms, bali beads, spacers and wire are .925 sterling silver.